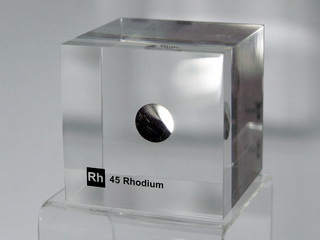 Rhodium was discovered in 1803 by W.H. Woolaston in London. 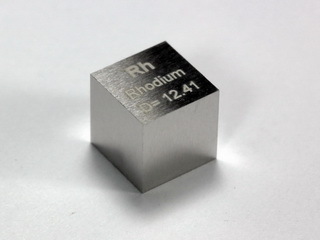 One of the rarest metals on earth (abundance of 2 x 10-4 ppm), rhodium does not appear naturally, tending to be found with other platinum group metals. 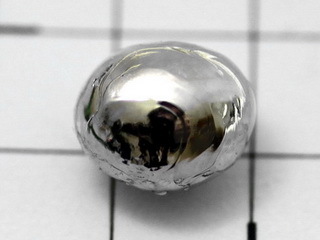 It is a hard, lustrous, silvery colored metal which is stable in air. Rhodium is inert to all acids but is attacked by fused alkalis. The metal has high thermal and electrical conductivities and is alloyed with platinum to form the positive wire of a Pt/Rh - Pt thermocouple. Other applications of the material include its use as a plating material (to provide a hard and bright surface which is resistant to oxidation), as a catalyst and also as an alloying element, where it improves the hardness of the resulting alloy. 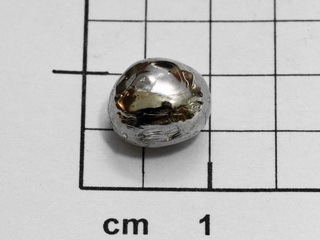 Nice Rhodium 3+ doped glass bead NEW!